Good morning and welcome once again to the New York Fed's Quarterly Regional Economic Press Briefing. I am pleased to have this opportunity to talk with the journalists covering our region—and through you, to the people in our District. This morning I will discuss national and regional economic conditions, with particular attention to household debt in the nation and especially in the Second Federal Reserve District, which covers New York; northern New Jersey; Fairfield County, Connecticut; Puerto Rico; and the U.S. Virgin Islands. Following my remarks, my colleagues will provide more detail. As always, what I have to say reflects my own views and not necessarily those of the Federal Open Market Committee or the Federal Reserve System. To provide context, let me first comment on national economic conditions. Since the Great Recession ended in 2009, the economy has grown at a modest pace. When we last met, in October, the available data showed that we hit a soft patch at mid-year. The recovery had slowed, extending the time before employment and inflation could be expected to return to levels consistent with the Federal Reserve's dual mandate. And, with the loss of economic momentum, downside risks had increased. In order to foster greater economic momentum, reduce downside risks and speed up the return to more normal levels of unemployment and inflation, in early November the Federal Reserve announced its intention to purchase $600 billion of Treasury securities. These purchases helped to ease financial conditions, thereby stimulating economic activity. More recently, we have seen signs of a pick-up in the pace of growth, with activity in the second half of 2010 turning out to be considerably stronger than most analysts expected. Real final sales grew at a 4 percent annual rate over the second half of 2010, up from 1 percent over the first half, led by surprisingly strong growth of consumer spending, continued strong growth of exports and slower but still healthy growth of business fixed investment. Several notable forces combined to encourage the resumption of stronger growth. On the policy side, as I mentioned, the Federal Open Market Committee provided further stimulus through purchasing Treasury securities. This, plus the lagged effects of its previous measures, helped to improve financial conditions. Also, the Board of Governors' Senior Loan Officer Opinion Survey indicates that, while the absolute level of lending standards remains tight, banks did begin to ease standards somewhat in the second half of 2010. The pick-up in the economy has occurred despite renewed weakness in the housing market. Home prices have softened anew and construction activity remains stuck at a very low level, likely reflecting the continued large supply of unsold homes. We believe that it will take more time, perhaps as much as another year, for enough of these homes to be bought that residential construction might begin a meaningful recovery. On the labor front, the most recent employment report for January 2011 is quite difficult to interpret. Only 36,000 nonfarm payroll jobs were added, well below expectations. Yet, we get a very different perspective from the unemployment rate, which fell by 0.4 percentage points for the second month in a row and now stands at 9.0 percent. Job growth was undoubtedly held down by the severe winter storms that affected many major cities, including our own. The decline in the jobless rate was not an unmitigated positive, as a significant part of this decline was due to fewer people looking for work. Thus, neither the disappointingly slow job growth nor the welcome steep drop in unemployment seems to paint the full picture. The truth lies somewhere in between. Despite the stronger job growth that we expect in the months ahead, we will continue to have a substantial amount of slack in our labor markets that will take time to absorb. At this point, while the soft patch is over and the risk of a double dip has subsided, the economy still faces headwinds as a result of the aftermath of the financial crisis, the housing bust and the high level of unemployment that still prevails. As banks and other financial institutions seek to strengthen their balance sheets and avoid future credit losses, they may keep credit conditions tighter than normal. In addition, many consumers' borrowing options may be limited by their impaired credit histories, and the recovery is not getting the strong boost from home construction that most previous recoveries have benefited from. Furthermore, as I will discuss later, households are still feeling the financial impact of lost wealth and jobs, which makes some cautious about spending and investing. The economy is healthier, but it is not yet well. In order to reduce joblessness significantly over the coming quarters, the economy needs to grow at a considerably faster rate than we have seen so far in this recovery. I am happy to say that we believe that conditions are in place for such higher growth in 2011 and 2012. We entered this year with a fair amount of momentum. Business and household spending has strengthened, presumably reflecting greater confidence in the economic outlook and progress in the repair of household balance sheets. Businesses are expanding their investments in equipment and software at a healthy pace. And, their spending on nonresidential structures, such as office and factory space is no longer contracting as sharply as it was a year ago. Further support comes from the agreement by Congress and the administration to postpone some tax increases, to reduce payroll taxes temporarily and to extend unemployment benefits. In addition, our exports continue to expand, supported by strength in demand abroad, particularly in Asia. Higher growth, a steady reduction in spare capacity in the economy and continued stability in inflation expectations should also slowly begin to reverse the recent decline in core inflation. Inflation was quite low during the second half of 2010, but we expect that to be the low point of the cycle. In short, viewed through the lens of the Federal Reserve's dual mandate—the pursuit of the highest level of employment consistent with price stability—the current situation remains unsatisfactory. However, we appear now to be moving in the right direction. Now, how is our region doing? Overall—in contrast to the pick-up in the nation—the regional economic recovery appears to have paused in the fourth quarter. More similar to the nation, joblessness in the region has retreated somewhat from the peaks recorded toward the end of 2009, but remains unacceptably high. As attendees at previous regional press briefings may recall, the New York Fed produces Indexes of Coincident Economic Indicators to help monitor the performance of the regional economy. Based on these measures, the upturn in economic activity that we saw for much of 2010 in both New York State and New York City has paused. To be sure, activity in both the state and the city is higher than a year ago, but we saw no increase over the prior quarter. This pause is particularly evident in New York City where the economic recovery had been relatively strong. By the way, let me note that this pause occurred before mid-December, so it cannot be attributed to the recent spate of heavy snow storms. By contrast, New Jersey's economy has seen no pick-up in activity and, in fact, activity there continued to decline at a modest pace through the end of 2010. We monitor Puerto Rico using an index produced by the Government Development Bank of Puerto Rico. This index shows that the recession there, which started back in 2005—well before that experienced in the mainland—appears to have subsided. As of November of last year, activity was no longer falling, although indications of a recovery are still mixed. Turning to jobs, the latest data indicate that businesses in the region, on balance, were not expanding their workforces at the end of last year. As a result, the total number of jobs in the region has held steady, lagging behind the job growth rate experienced nationally. Much of this recent weakness in employment stems from job losses in the retail, wholesale and manufacturing sectors in our region. In the rest of the nation, these sectors expanded during the last quarter. Moreover, our state and local governments cut jobs much more severely than governments did elsewhere. At the same time, job gains in some of the region's strongest sectors—professional and business services, finance, education and health—were not large enough to completely offset these losses. At this point, it is difficult to say whether the recent pause in job growth is short-lived or not. 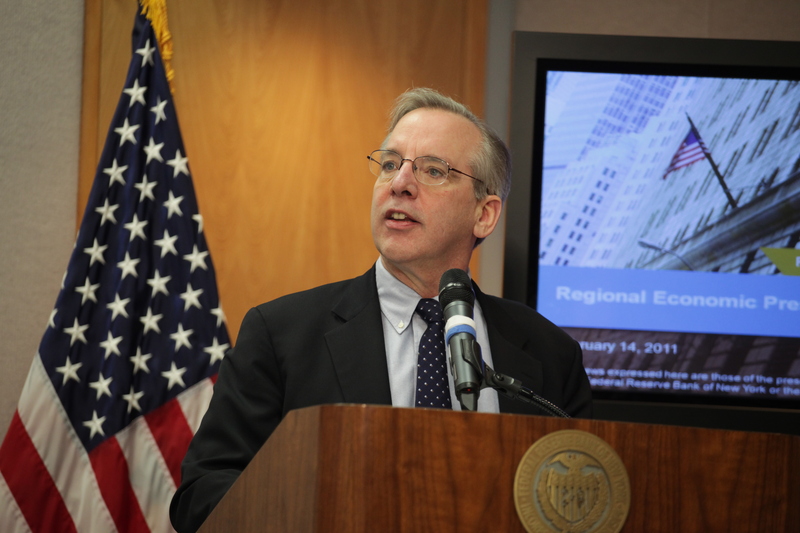 As such, we will continue to closely monitor our region's job situation. Meanwhile, unemployment rates have ticked down across the region. Given the disappointing job numbers, it is not surprising that this change is largely due to a decline in labor force participation. In the fourth quarter of 2010, the labor force of both New York and New Jersey declined by about 0.3 percentage points, meaning that fewer people were actively seeking work. December's unemployment rate in New York and New Jersey, at 8.2 percent and 9.1 percent, respectively, were below the national jobless rate of 9.4 percent for that month, though these rates remain painfully high. Puerto Rico's 15.7 percent unemployment rate, although down from its high of over 17 percent, still shows little evidence of a sustained improvement. Now, let me turn to this session's special topic: household debt. 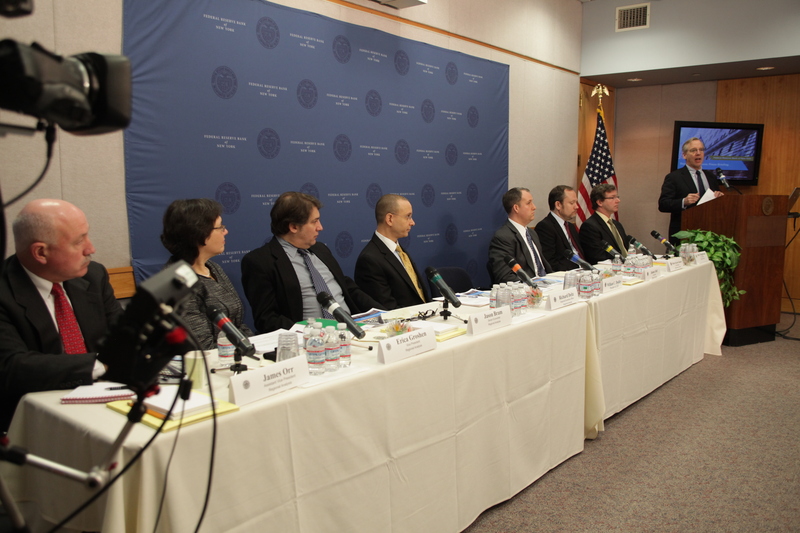 This topic provides an important lens into economic conditions in our country and our region. How families are adjusting their saving, borrowing and spending in the aftermath the mortgage crisis and the Great Recession will help shape the path of the recovery. Here at the Federal Reserve, we try to answer questions such as: what is happening to households' credit, debt and delinquencies and what economic consequences will that have? This monitoring and research on household debt and credit conditions helps us better understand the connections between financial market developments, the broader economy and families' well-being. We follow a variety of metrics, including lending activity, the level of interest rates and of interest rate spreads, survey data on lending standards, delinquency rates on loans, and home and other asset price changes. One new, key source of information on household debt and credit conditions is the New York Fed's Consumer Credit Panel. As you heard a few moments ago, these data are now available for all of 2010. They come from a nationwide sample covering all households where at least one member has a credit report. The records tell us about five major categories of household debt—mortgages, home equity lines of credit, and credit card, auto and student loans. To set the stage, one can think about the recent path of household debt in three phases. During the run-up to the recession—the years leading up the crisis—households borrowed a lot of money. They took on higher credit cards balances, auto loans, student loans and, especially, mortgages. As the crisis unfolded in 2008, many families' debt burdens proved unsustainable: delinquencies rose dramatically and household debt began to fall sharply. Now, we appear to be entering a process of gradual convalescence, as delinquencies begin to subside and some households begin to expand their borrowing again. The nature of the run-up to the crisis has been well-documented, so let me focus here on the latter two phases: the crisis and convalescence. During the crisis, weakness in the housing market contributed to financial strains as many families found that their mortgages were "underwater," that is, their homes were now worth less than their mortgage balances. As a result, they had no financial buffer they could tap if their finances came under stress. And, as the economy weakened further, many households faced sharply reduced incomes as family members lost their jobs or had their work hours cut. So, more families found it difficult to pay their credit card bills and other debt obligations on time. As a consequence of these strains, households began the painful process of deleveraging. They started reducing the amount of debt they owed, relative to their income. During the run-up to the recession, households were saving only about 2 percent of their income; now they are saving around 6 percent of their incomes. This increase in saving was mostly used to pay down their debts, but it also included adding to their savings accounts and borrowing less. Of course some of the reduction in debt reflects loan charge-offs of bad debts. But work done here with the Consumer Credit Panel shows that some consumers also became more frugal, rebuilding their net wealth by paying down their debts. These actions enabled families to rebuild their financial reserves—precautionary funds that could be used in the event of a job loss or illness—to maintain their consumption and keep up with their mortgage payments. But to save more, it also means that they had to consume less, which dampened economic activity further. Interestingly, student loans are the only part of household debt that continued to rise throughout the crisis. More families and students may have needed to rely on loans to fund education during the difficult times. And going to school was more attractive for some, given the deterioration in labor market conditions. Just as households began deleveraging during the crisis, banks needed to respond in light of the large loan losses that they were taking. As defaults rose, banks tightened their underwriting standards and raised the margins that they charged on loans. As a consequence, they made fewer loans. This tightening of credit availability exacerbated the decline in real activity. It created an "adverse feedback loop" between the financial and real sectors of the economy that deepened the recession. There are several signs that we are now convalescing; this damaging dynamic—the adverse feedback loop—now appears to be reversing. From historical experience with financial crises we know that this phase is a gradual transition process—not a quick event—as households and banks slowly complete their painful adjustments. Once the adjustments are completed, households can consume more and regain their access to credit, and these developments help to support a more vigorous economic recovery. Of course, we don't yet know precisely where we are in this adjustment process. For example, families may choose a permanently higher rate of saving in order to rebuild their retirement savings. What they decide to do will depend in part on their expectations for future income, their outlook for the economy, what they think will happen to housing and stock prices, and prospects for taxes and benefits such as social security and Medicare payments. However, we do know that during good times few households are likely to be delinquent on their bills. And, overall, we'd expect their borrowing to grow at least modestly as the economy strengthens. The Household Debt and Credit Report released today indicates that there has been a pick-up in credit flows. Households increased their non-mortgage debt last quarter, a development not seen since the fourth quarter of 2008. The number of credit card applications increased—an indication of a pick-up in consumer demand for credit. And, the number of open credit card accounts also increased slightly—as more accounts were opened than were closed. Of course, signs of distress continued: households are still reducing their housing-related debt and delinquencies continue to be a problem. So, the adjustments remain far from complete. It is encouraging that credit flows are no longer contracting because households' renewed demand for credit has no doubt supported some of the recent rise in consumer spending. How much debt did our households take on during the run-up? How much deleveraging has occurred throughout the region during the crisis? Are we beginning our convalescence—have households started to increase borrowing again, and what signs of stress remain? One reason that households in our region have weathered this credit cycle relatively well is that debt levels are lower relative to income and this debt rose more modestly in the run-up to recession than in the nation as a whole. Using the debt-to-income ratio to help us make meaningful comparisons across different geographies, debt levels are particularly low in upstate New York and New York City. Three key exceptions to this generalization are Long Island, Edison, New Jersey and Puerto Rico, where household debt-to-income ratios have risen to levels above the U.S. average. Since the vast majority of household debt is related to housing, it is not surprising that debt-to-income ratios were highest and rose most in places that experienced rapid rises in home prices. So, for example, debt-to-income ratios are among the highest in the nation in those places most associated with the housing bubble, such as California, Florida, Nevada and Arizona. This relationship can also be seen within our region. For example, household debt grew more slowly than nationally and has remained relatively low in upstate New York, which was largely bypassed by the housing boom. The key exception is New York City, where a large share of residents rent their homes. Overall, city residents still have relatively low levels of mortgage debt, even though these debt levels rose during the run-up to the recession. Elsewhere in the region, debt levels tended to rise most in places where housing prices increased the most, such as Long Island and parts of New Jersey. During the crisis, in most parts of our region, households reduced their debts. But, because they had not accumulated as much during the run-up, the decline was well below the national average. In general, households in our region—with some exceptions that I will mention in a moment—have not been under as much pressure to deleverage. It's particularly notable that in upstate New York, where debt levels are well below the national level, households have actually continued to very slowly add to their debt. Clearly, deleveraging has not been particularly consequential for many upstate New York households. The deleveraging process in other parts of New York and New Jersey, while quite severe by historic standards, has proved milder than elsewhere in the nation. Nevertheless, many families in the region have had to make painful adjustments to their spending in order to pay down debts. These families tend to be concentrated in neighborhoods where households took on more debt during the run-up or sustained more severe income losses during the crisis. These factors contribute to delinquency rates that run well above average in certain areas, including certain parts of New York City and Long Island. In fact, some neighborhoods in these areas now have delinquency rates two to three times the national rate. Looking forward, we see some signs that the region is turning the corner on the credit cycle. After declining during the crisis, credit applications have begun to increase, suggesting that the demand for credit is rising. Although housing debt is still declining and delinquencies are still high, households in many parts of the region have sought and taken on some new debt in recent months. In particular, auto debt has been rising over the past year across New York, northern New Jersey and Puerto Rico—a signal that households in the region once again want to increase spending on durable goods, and are willing and able to borrow to do so. To sum up, although the national economy experienced a pick-up in activity during the last quarter of 2010, the region saw a pause. The loss of momentum locally is disappointing because until the fourth quarter, much of the region was recovering somewhat faster than the nation. However, I would not be overly discouraged by this. After all, soft patches are not uncommon during economic recoveries. Both nationally and regionally, unemployment remains stubbornly high, but many indicators suggest that conditions are in place for stronger growth in the coming months. With respect to debt, households in most parts of the region are in better shape than the nation as a whole. They increased their debt burdens less during the boom and thus have had less need to deleverage. In addition, there are emerging signs both nationally and regionally that consumers have begun to spend more and appear willing to take on some new debt. This bodes well for another step forward in terms of economic momentum in the nation and the region. However, high delinquencies in New York City and Long Island are a reminder that many households remain under significant stress.